Santa Monica, Calif.-based full-service agency RPA is the shop behind some of today's smartest campaigns for clients like Honda, Apartments.com and Intuit—most recently launching a 60-second spot for the 2016 Honda Civic featuring Empire of the Sun's catchy tune "Walking on a Dream." 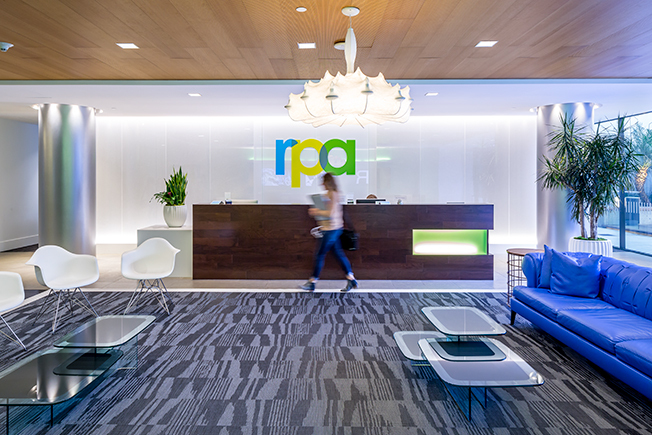 That laid-back attitude that RPA brings to its breezy ads is also evident in its digs. After housing RPA for 10 years, its SoCal space was redesigned in 2013 and boasts a full production studio, walls overflowing with awards, as well as quirky interactive elements. But for RPA, the devil is in the details. "We're a creative agency, so we looked at the redesign of our space as an opportunity to provide inspiration—even in often overlooked areas like hallways and meeting room walls," said COO Pete Imwalle. "Our favorite parts are the small details that you sometimes don't even notice right away." The head of a Viking ship is a prop from client Intuit’s Super Bowl spot. RPA’s in-house production studio, Bö’s House of Visual Arts, produces, edits, mixes and tags videos for all of its clients. Items on the wall pay homage to the production studio’s namesake, the fictional Bö. The outdoor space is an additional gathering area for employees and also serves as the hub for client events, happy hours, agency meetings and general downtime. The hand-drawn mural was designed by RPA group creative director Nathan Crow. This story first appeared in the March 21 issue of Adweek magazine. Click here to subscribe.